I guess you have also stared to think about what to serve your family and friends this Christmas. When I talk to friends and colleagues, it is great to see that everybody has their own approach to creating a Christmas dinner. Some follow traditions, such as potato salad and sausages (very popular in Germany), some offer trout, and others plan a full five course meal. My favorite Christmas dish is roast turkey. In fact it is the juiciest turkey you will ever have in your life. The brine will allow the meat to relax and take in extra moisture before roasting it in the oven, ensuring juicy thighs and a juicy breast. Mix all of the ingredients for the brine with the water and make sure your stir everything until all the salt has dissolved. Squeeze the orange and lemon into the mixture then add the whole quarters as well. It is important to find some space in your fridge to fit the turkey and the brine bath, you will probably need to use your largest stock pot for this! Think ahead as Christmas is always a busy time with limited space in your fridge! The secret to a really juicy turkey roast lies in leaving it in this special brine in your fridge for 48 hours. Before roasting it’s important to take the turkey out of the brine, dry the skin using kitchen paper and let it come up to room temperature. Preheat the oven to 220°C and put the turkey in. After 20 minutes reduce the heat to 180°C, then leave to roast (please calculate about 2.5 hours for a 5.5 kg turkey). Check the color (it should be golden brown) and the temperature of the turkey. Check if the turkey is done by inserting a metal skewer into the thickest part of the breast or thigh or if you are using a meat thermometer it should be above 64°C. If the juice running out after withdrawing the skewer is clear, the turkey is ready. Put the heat up to 220°C, glaze the turkey with the butter and honey until it is an even golden brown color. Take the turkey out of the oven and let it rest for at least 20 minutes before carving. This is VERY IMPORTANT to ensure the juices stay inside the meat. I hope you enjoy this recipe! 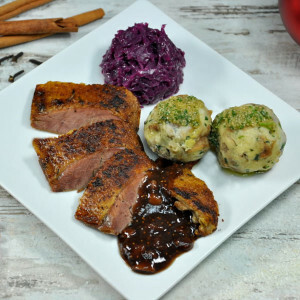 I serve it on Christmas Day with cranberry sauce, German potato dumplings, and red cabbage.